Down captain Joe Lennon holds the Sam Maguire Cup up to the crowd after the Kerry v Down All Ireland Senior Gaelic Football Final, 22nd September 1968. 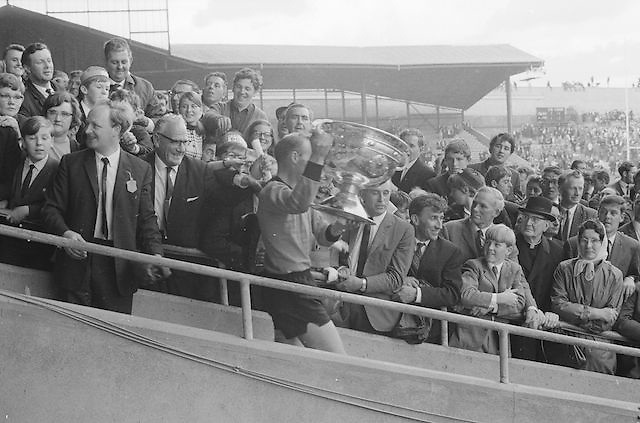 Down captain Joe Lennon holds the Sam Maguire Cup up to the crowds after the All Ireland Senior Gaelic Football Final Kerry v Down in Croke Park on the 22nd September 1968. Down 2-12 Kerry 1-13.